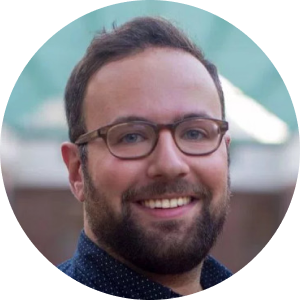 Michael is General Manager, Service Hub at HubSpot and a guest blogger for Guru. Join Guru's upcoming webinar with Michael for an interactive discussion on the paradigm shift in customer service, and how the function is becoming a key revenue driver for businesses. Customers expect more than ever before. And among all the modern options for customer service, customer success, customer education, and customer support, it's easy to miss the "why" behind any of those choices. I ran Customer Success at HubSpot for years, and if I learned one thing, it's that understanding the "why" is the very most important step customer success leaders must take before jumping into a new program. Customer education can turn into an amazing asset for customer-facing teams and customers alike. Or, it can languish and flounder among other tools in the customer support toolbox. But the reasons below are, in my experience, some of the amazing reasons "why" behind a customer education program. If you're thinking of starting a customer education program, hopefully some of these fit your circumstances and will help you grow better customers over time. Customer education can take the form of whatever best serves your customers, so you can evolve it over time as you learn more about them. For example, your customer education program might begin with an FAQ page on your website that prospects and customers can use to learn about your product or service. But as you start growing your customer service team and they talk to more customers and resolve more tickets, they might identify some troubleshooting questions that seem to come up again and again. From there, you can start building a knowledge base of help documents you can use to reinforce customer conversations – or, hopefully, that customers will consult to get the answer they need faster than going through the process of reaching out to the support department. You might find that video is a helpful medium through which to create instructional how-to videos to guide customers on how to use your product or service, and you can start producing videos for YouTube or social media to share with your community. Eventually, you might reach the point with the proliferation of your product or service in the market that it makes sense to create an academy with courses and certifications that offers users in-depth product and methodology training, as we've done with HubSpot Academy. Whatever the specific size and needs of your customer base, you can accommodate them with one or more of these customer education initiatives. Your customer support team is there to react to incoming customer questions and issues. But with a customer education program, you'll be able to free up some of their time with simpler questions so they can tackle major bugs and troubleshooting. By setting up an organization to help customers help themselves with smaller problems more easily, you'll free up your team's time to fix what's broken, and to work more proactively to deliver customers more value from the product or service. Making the shift from solely reactive customer support to proactive customer success, with the help of technology, will set you up to build long-term customer loyalty, and a more efficient customer-facing organization. When your teammates in sales are on calls with prospects, they have a ton of resources at their disposal to answer prospect questions to try to differentiate from competitors in order to close a deal. With customer education, that's one more advantage your company offers that competitors might not – and sales reps can use customer education as a selling point to demonstrate the kind of support they'll receive as a customer. Customer education also helps the sales reps themselves become product experts so they can better answer questions that come up over the course of a call or demo. Help documentation and instructional videos will better support the end-to-end customer experience – and your colleagues in sales, too. When you create and publish public-facing documents about how to use your product or service, you'll start ranking for branded keywords in search. More and more prospects and customers are searching for specific keywords, like "how to use HubSpot CRM free," or "how to write a blog post in HubSpot." These are examples of real branded keywords people search for that HubSpot's knowledge base actually answers. 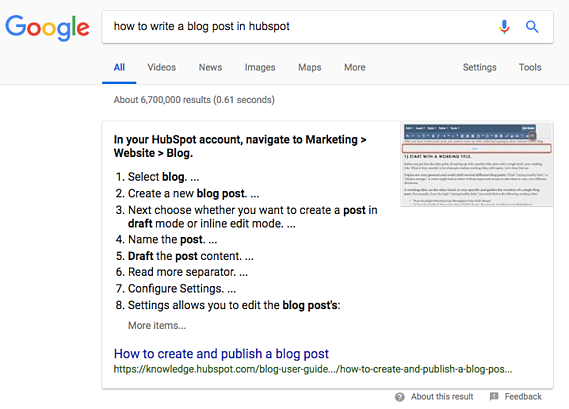 In cases with keywords like these, a well-written blog post isn't necessarily the best solution – instead, a help document with step-by-step instructions will better capture the searcher's intent and get them the answer they need faster. Customer education is a cost-effective way to answer customer questions on a 1:many scale. Your people will always be your company's competitive differentiator when it comes to creating an exceptional customer experience, but your customer education offerings will help your customers and make them more loyal to your brand. While your customer support reps and customer success managers are having 1:1 conversations with customers and using their training to cultivate and retain a pipeline of happy customers, your customer education program will serve to help them obtain maximum value from their purchase and get easy answers instantaneously. We all like to think our jobs are indispensable, and for the most part, they are. But that doesn't change the fact that, for a lot of people, the idea of picking up the phone or sending an email to get a question answered isn't as appealing as consulting a search engine. Your customers want to be able to self-serve – their time is as precious as yours, and sometimes the answer to scaling your customer support offerings isn't by hiring another person. Instead, you can use technology to support your team members' hard work so customers can get assistance across a variety of different channels and methods. Customer education is the way forward-thinking, innovative companies will continue to attract and keep customers. It's a modern way to help and support your customers that doesn't make them beholden to your team's hours and workflows – instead, customer education will help you attract site visitors through search, set your company apart from competitors during the sales process, and help your customers help themselves alongside your own support team. Catch Guru's upcoming webinar with Michael Redbord, General Manager, Service Hub at HubSpot on December 4, 2018 at 10am PST/1pm EST. Register now!